Despite repeated attempts from friends and family to convince me otherwise, Halloween remains my least favorite holiday. Every year on October 31st, I find myself curled up in my bathtub with my dog and a shotgun—just like Will Smith trying to hide from vampires. But what’s really out there is far scarier than ghouls, goblins, ghosts, monster, or even masked serial killers: Small children, hopped up on the Jujubes , chasing their next sugar high. I warn you: Get in their way at your own peril. WIth an entire year between us and the next terrifying All Hallow’s Eve, I thought it a good time to consider scary gadgets in the broad light of day. For nothing is less frightening than a guy dressed up as a giant pumpkin the day after Halloween. And so, with the sun at our backs, we can laugh blithley at a visit from the walking—or, well, shuffling —dead, a comfortable freak of nature, and—scariest of all—Steve Ballmer playing dress up. 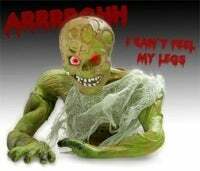 Ooh, watch out for this scarrry zombie . Even with no legs, he’ll come after you, moaning and groaning the whole time, whining about his lack of lower extremities. Not very scary, is it? No, this is what passes as a brilliant use of technology on this truly terrifying day. Spend £20 (~$40!) on a rubbery crawling zombie that—to boot—requires three not included AAA batteries. Okay, I’ll admit the glowing red eyes and the ability to detect motion makes him marginally scarier, but certainly no more frightening than the imminent looming collapse of America’s stock markets due to subprime mortgages. Now there’s a tale that has children hiding under the covers the country over. There’s nothing scarier than the course of human events gone terribly wrong . Look no further than the Slanket. What’s so scary about it? It’s a blanket with sleeves . Work with me, people. If blankets were meant to have sleeves , they would be sweaters . But no, we’re people and we must try to twist the very order of the things—the fabric of the universe, if you will—around our little fingers. If you ask me, having to look for sleeves defeats the entire purpose of a blanket, which is something you can just throw over yourself without having to figure out which way is “up.” But now I’m supposed to pay for the privilege of keeping my arms warm and my hands cold? What’s next: a Slanket hoodie? Available in your choice of nine distinct colors, ranging from Apricot to Limoges (that’s a color? 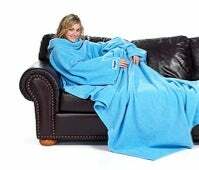 ), the Slanket will run you a cool $45. Or, I suppose, a warm and toasty $45. The most frightening thing about Halloween? DEVELOPERS! Few men in a position of power are as thoughtful, reasoned, and gosh-darn-it, as eloquent as Microsoft CEO Steve Ballmer. One only need think of his impassioned exhortation on the importance of computer developers, or his awe-inspiring interpretative rhythmic performance. Truly, he is an man of many skills, whose impressive talents— aaaaaaaaaaaaaagh ! In honor of this day of national dress-up, the folks over at the Joy of Tech have capitalized on the success of their earlier Steve Jobs paper doll to bring you a brand new frightening vision of the future — Ballmerized . Do what you will with the man; personally, I like the Frankensteve/ballerina look. That’s one route for next year’s costume. If I want to cry myself to sleep at night, that is. I see the tears at the corners of your eyes and the telltale quiver of your lip. So only now, at the end, do you truly understand my fear of this, the darkest night of the year. I just hope we make it to next week.